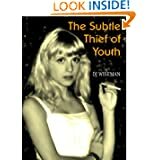 The Subtle Thief of Youth is the second novel I’ve read by D.J. Wiseman and he did not disappoint. The rain began as a few drops leaving circles in the dust, and then it steadily began to fall harder. I felt as though I was standing right there, the description handled so well I could almost feel the pelt of rain on my skin and sense the panic of people as the water rose higher and higher, destroying everything in its path as it flooded the countryside. A full decade has passed since an eleven-year-old girl went missing and is never heard from again. Ten years later a tree is uprooted in a flood of mud and water, exposing the skeletal remains of Melanie Staples tangled in its roots. Is it coincidence or something far more sinister that another young girl comes up missing on the exact day Melanie’s body is returned to the community? I found myself intrigued as the mystery continues to grow. We follow the paths of a host of colorful characters: a withdrawn stonemason, a church-goer with a hidden fetish, a Sri Lankan student never quite accepted by the locals, and a vicar who likes to keep secrets. But some secrets aren’t meant to stay buried. What, if anything, does the death of Melanie Staples have to do with this latest girl’s disappearance? The answers to this mystery definitely left this reader surprised at the end. D.J. Wiseman is an expert at getting inside the characters’ minds. He understands what it takes to build a relationship between reader and character, never rushing things. By the end I felt as though I knew each one of these people on a personal basis. We feel their pain, their fears, and their desperation to keep painful secrets hidden from prying eyes. Posted by Denna Holm on December 10, 2013 in Archives and tagged 5 stars, murder, mystery.